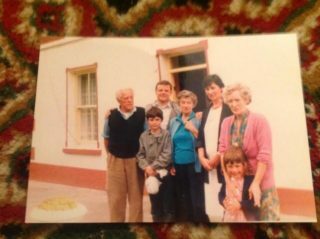 My mother, Rita Hawkins was born 29/06/1927 in Beech Hill, Woodlawn to parents Catherine (nee Dunne) and Patrick Hawkins. She was the youngest in the family. Siblings include Mary-Kate, Bridget (Dillie), Sarah, Lucy, Joseph, Teresa (Tess), Patrick (Patsy), Norah (Nonie), Margaret (Meg) and Rita. The picture of pupils at Shanballard N.S. 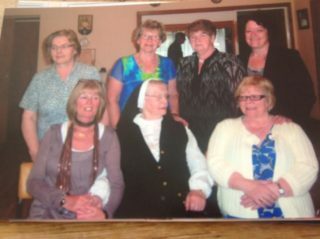 in the 1920s was found in my Aunt’s belongings, Sr. Theresa Hawkins . She was the last of that generation. 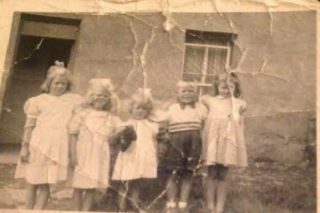 Tessie Hawkins started school in Shanballard 1924. 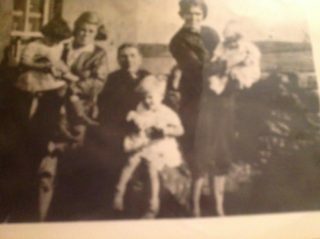 My mother Rita was registered in Shanballard 1933. Others registered at the time were MAry Kate Cormican, Kathleen Mannion, Ita Melody and Mary Kate Hurley. My mother is not in the picture from 1926 as she would be too young. She had possibly already left Shanballard N.S. when the picture was taken in 1940s. To the best of my knowledge my mother left Beech Hill when she was 18 years old for England. That would be c. 1945. 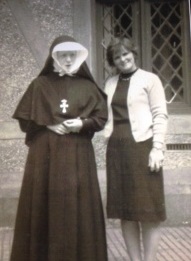 This is the earliest picture I have of my mother, pictured with my Aunt Theresa. If anyone has any information regarding my mother Rita Hawkins, in particular if you know of any pictures including her, please contact me through this web-site. I am including a number of photographs of family members to help jog any memories. This page was added on 24/04/2017.